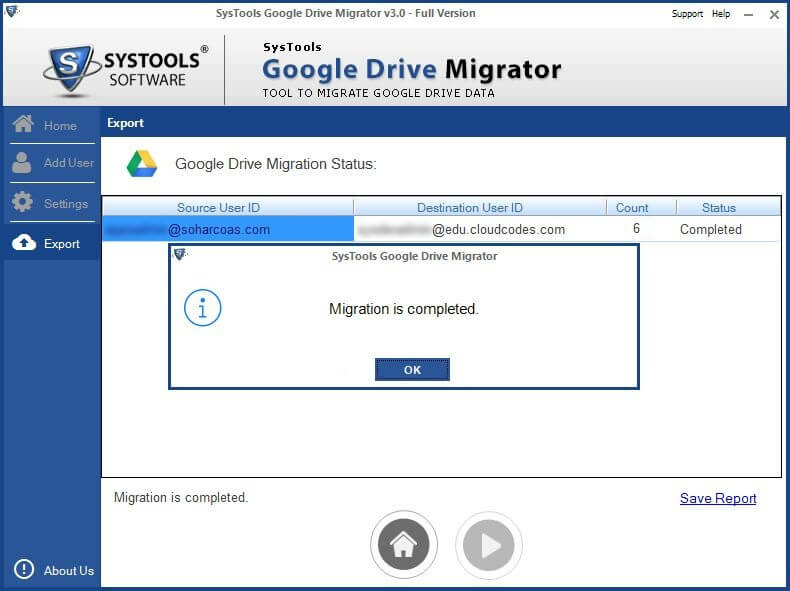 The G Drive Migrator software enables users to move documents, pictures, audio files, videos, PDFs, etc., from one Google drive to another. This Google Drive exporter only requires permissions from G drive account to fetch and add items to the targeted drive. The G Drive Migrator allows the user to access the Shared data in the account even after the migration process. The software enables users to backup Google drive to another account or domains. It will migrate items like documents, audio files, PDF, pictures, etc., stored on the Google Drive cloud. 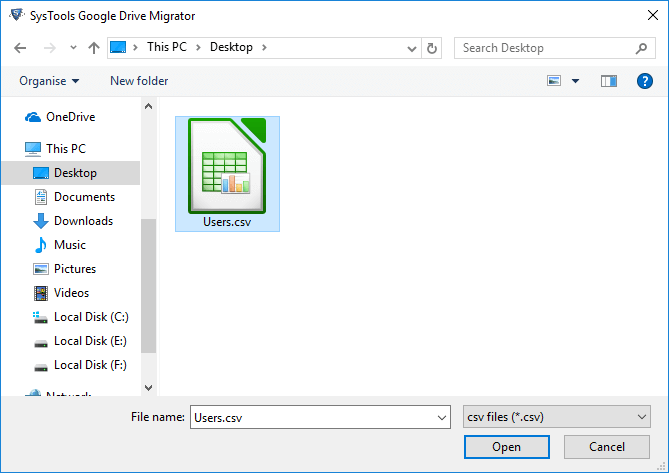 G drive data migrator utility brilliantly supports incremental migration where already existing data are not migrated in targeted Google drive account. Add User: This permit users to append one origin and targeted email id at a time. Add CSV: Browse a CSV file, which comprises of multiple user IDs within it for bulk migration. Remove User: Remove the already added email ids with help of this option. 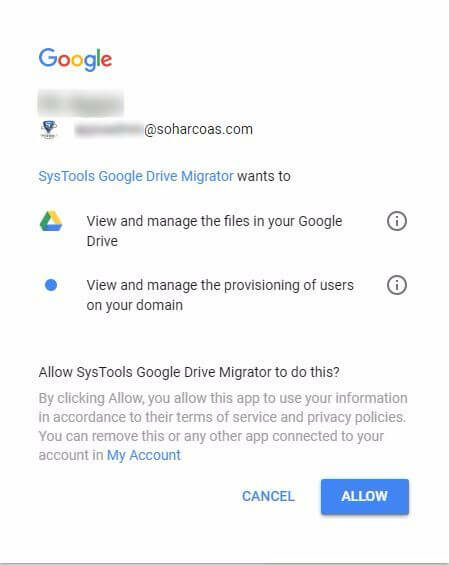 Migrate Permissions: This option permits users to transfer Google drive storage to another account with all their respective permissions like read, write, and comment. Migrate Deleted Items: Users will be able to backup Google drive to another account with all deleted items too. Migrate Shared Files: Clients will be able to get access to their shared items. The software is having the capability of customizing and saving items in a separate folder. Maintain Folder Hierarchy: An additional option is rendered by the software to maintain folder structure in the targeted Google drive. Admin User Account: This will help an administrator to attempt domain to domain migration. For a successful migration, an individual needs to ‘Add Scope’ at the domain level. 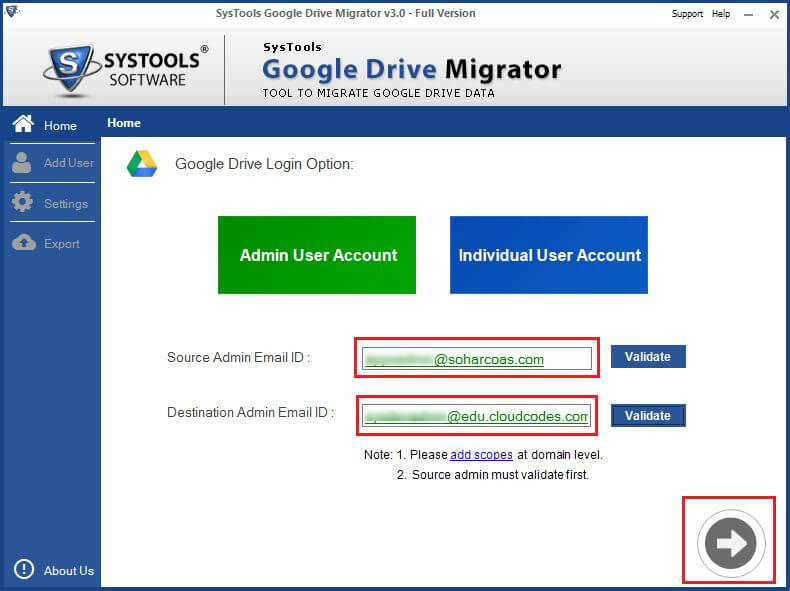 Individual User Account: The feature will help users to carry out Gmail to Gmail, Domain to Gmail, and Gmail to Domain migration. Users only need to mention account credentials for each account and then, validate them. 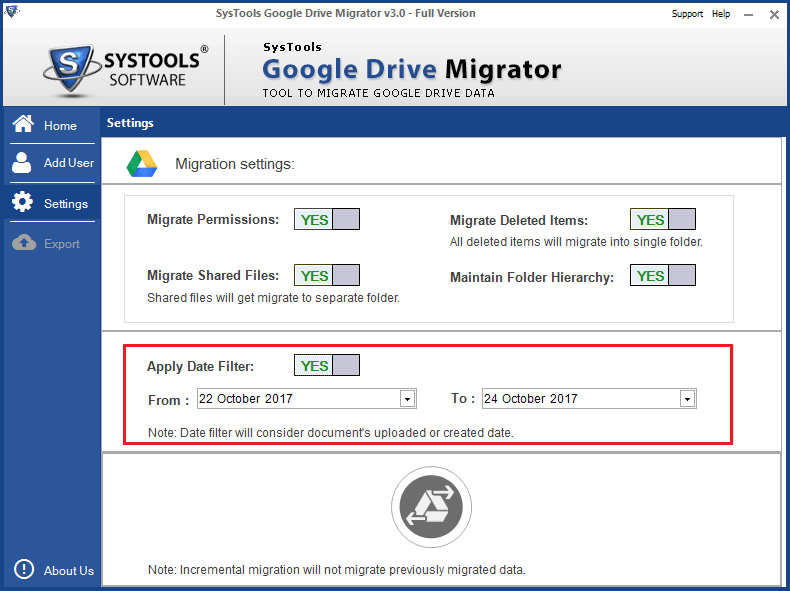 Google drive to Google drive migration provides a date-based filtering feature to export items of a particular time period. All the documents, PDFs, audio files, etc., which falls under the specified date range will be moved to the targeted platform. One just needs to mention ‘From’ to ‘To’ date range for using this filtering feature. Remember one thing that the migrator filters out data on basis of file creation date and file uploading date. 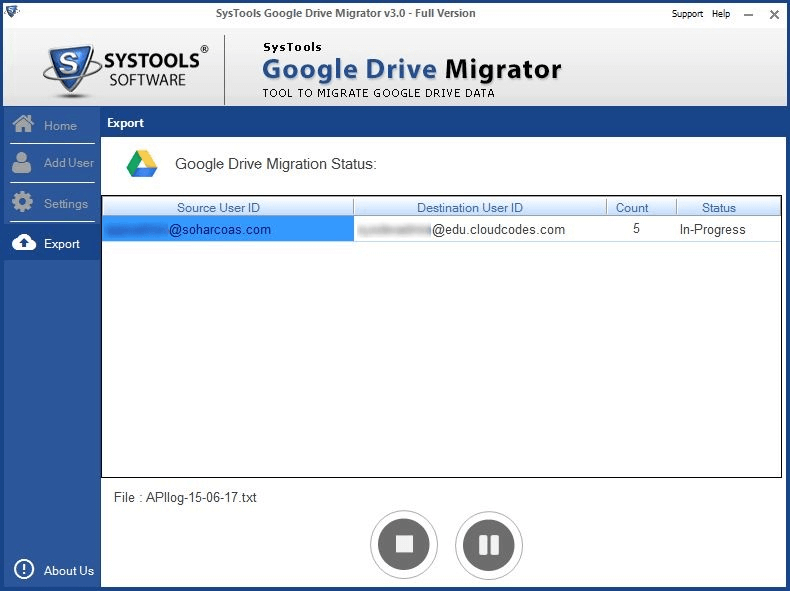 When G Drive migrator software starts transferring files from Google drive storage to another account, it displays live status of the procedure. The status will be displaying current item count (total files completely moved in targeted account) and the status of migration procedure. If facing any issue then, users can pause the procedure with the provided button for it and then, resume it from the point where it was interrupted. How to Move Google Docs from One Account to Another? Step 6 : The browser will display a message i.e., ‘Received verification code. You may now close this window’. Close the opened browser screen to get back to your wizard. Q. Can anyone guide me a solution to ‘Add Scope’ in administrator accounts? Q. Can I move Google docs from one account to another without any risk of data loss? Ans: Yes, there will be no data loss while working with our software. It is 100% guaranteed that actual formatting and styling of document files will be kept intact throughout the migration procedure. Q. Can I transfer photos from one Google account to another on Windows 10 with your tool? Ans: Yes, our tool is compatible with all editions of Microsoft Windows operating system. 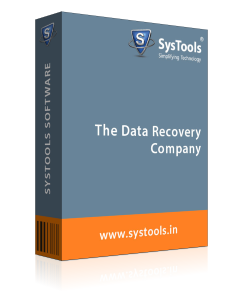 You can transfer all kind of data from our software without any limitation or compatibility issue. Q. 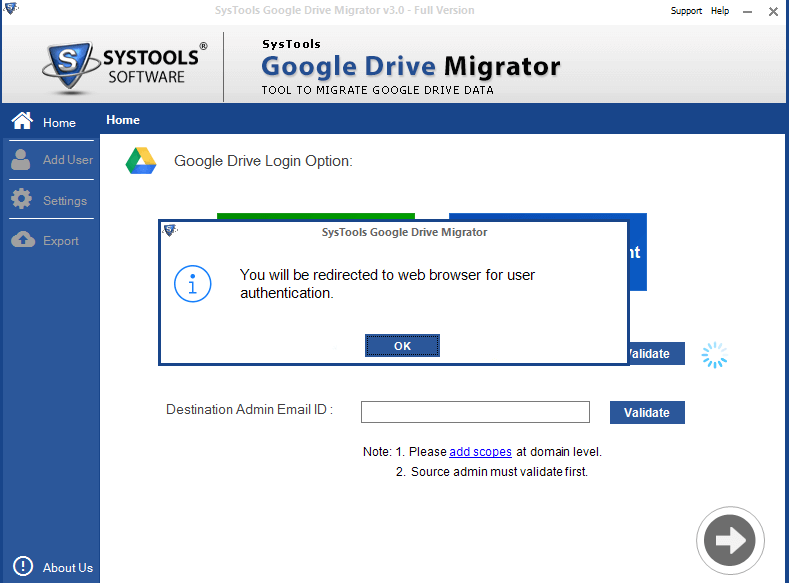 Will your software export Google drive to another domain without password of source admin email account? Ans: No, it is mandatory to have complete credentials of administrator email addresses. The tool does not require users account password if the scope is added at the admin level. But, if you have forgotten the password of your admin account that nothing can be done. Note: G Drive Migrator Software will get delivered on your registered email id, within few minutes after placing the order. How do I transfer photos from an old Google photo account to a new one?” - this was a nightmare question for me. But thank god, my friend told me about this SysTools product. The software brilliantly moved all my pictures without any manipulation to the targeted account. 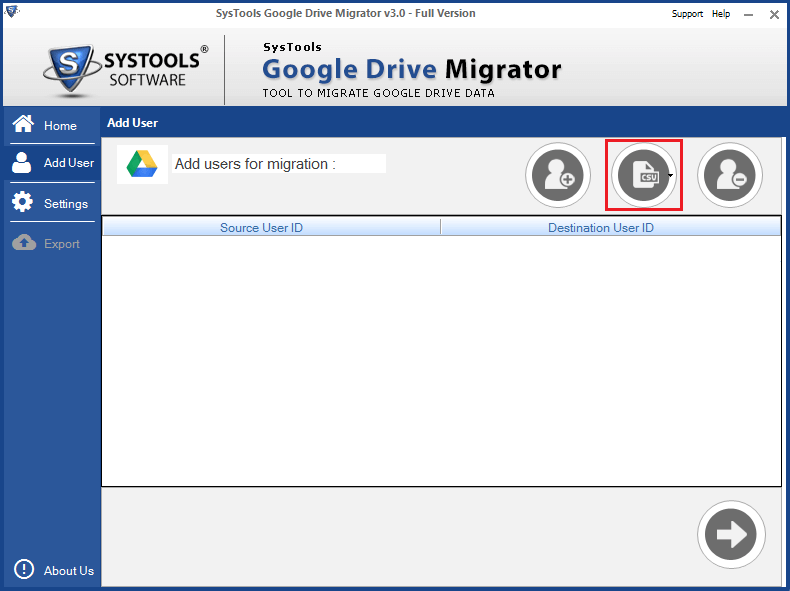 G drive to G drive migrator made the most difficult procedure the easiest one. Thank you! I have never imagined that it can be so much easy to backup Google drive to another account. This software is the best and perfect solution to move items from one G Drive account to another. 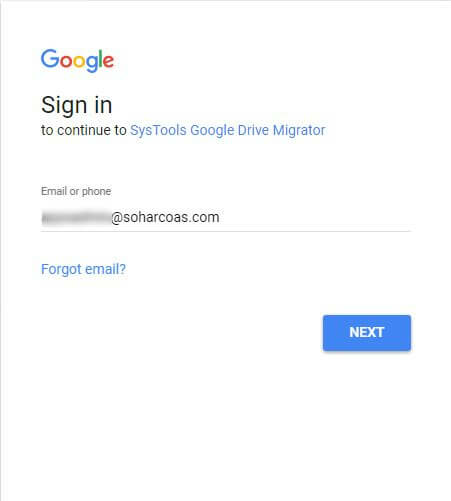 I loved the way it works in a smooth manner and sometimes feels shocking that there can be an easy solution for Google Drive to Google Drive migration. Superb work was done by the development team! 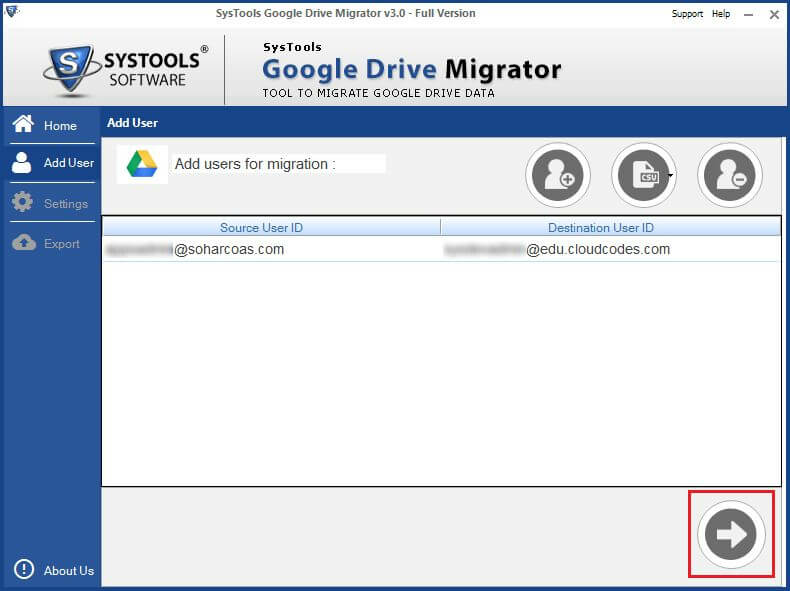 G drive migrator tool is the amazing solution to move Google docs from one account to another. The easy-to-use GUI of the application makes it simple to attempt the data transferring procedure. It does not require any highly skilled technical expert to execute the application. Great hard work is shown by developers in programming such kind of smart utility.